(Host) Newport has long suffered from having the highest unemployment rate in the state. But new businesses are cropping up to fill some empty downtown storefronts. Local officials say a crop of energetic young business owners and the prospect of some major foreign investments herald an economic renaissance for the city. (Zind) Newport makes the news every month. Each time state unemployment figures are released, the city on Lake Memphramagog tops the list. The March unemployment figure for Newport is 9.4 percent. Mayor Paul Monette doesn’t deny it says something about Newport. (Monette) "I think it basically tells us that we lagged behind some of the economic boom that the state had." (Zind) But Monette says Newport is beginning to change and the day may come when it doesn’t top the unemployment list. 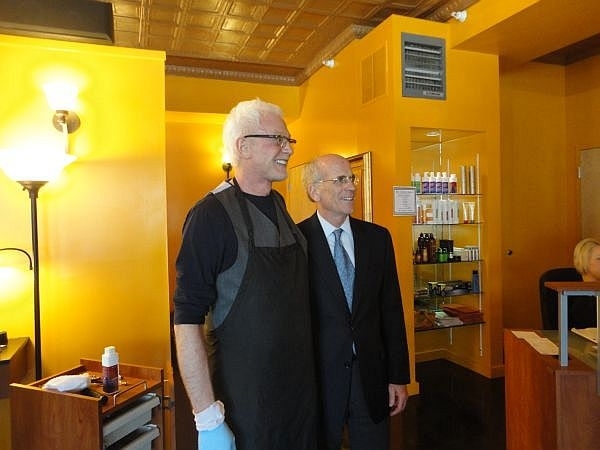 Touring the city on Wednesday, Congressman Peter Welch found some evidence of that. (Welch) "Can I have a picture with you before I go? I want to show people the man who’s going to make me presentable." (Zind) A year and a half ago, Jon Somes moved his high-end salon business to Newport from Taos, New Mexico. (Somes) "I knew people here and I like it here. I think that really interesting people congregate in more remote areas." (Zind) Somes’ livelihood depends on both locals and some who travel from farther away to his salon. And he says business is good. Another recent transplant is Midwesterner Ruth Sproull. She opened a bed and breakfast called Little Gnesta about a year ago, after researching other locations. (Sproull) "I looked at the north shore of Lake Superior and then a friend said ‘check out Vermont.’ Lake Champlain was too expensive. So I did an Internet search and Newport came up." (Zind) Sproull’s B&B caters to vacationers interested in biking, hiking and the like – what she calls the "silent sports." She says, so far, business has exceeded her expectations. Another newcomer is Scott Shipley. Four months ago he moved from California and opened Habaneras Mexican Grill on Main Street in Newport. (Shipley) "The weather is nothing to brag about, really, but the people are so nice here, nothing like California. Every day I love being here." (Zind) Shipley says business has been slow, but he’s hopeful it will pick up as the weather warms. On top of these new local businesses, local officials point to the pending arrival of AnC Bio, a South Korean firm lured to the area through the federal EB-5 program, which offers visas to big foreign investors. There’s also the application to declare the airport and an industrial park in Newport as "foreign trade zones," another effort to attract manufacturing to the area. Does all this add up to a Newport turnaround? Patricia Sears thinks it does. As executive director of the Newport City Renaissance Corporation it’s her job to be optimistic about the future. (Zind) "Now my guess is if I’d been here 10 years ago talking to someone 10 years ago, they would have expressed the same optimism you’re expressing." (Sears) "One of the things that I find in my position is that there’s a habit of enjoying the real sour taste of lemon: ‘No, we tried that before, it will never happen.’ Now things are happening that people are enjoying the taste of lemonade and the sweetness isn’t scaring them and they’re willing to roll up their sleeves and be part of the success." (Zind) Sears says the city is only now beginning to see the results of the work that’s gone into turning Newport around.